Editor's Note: This article is the fourth in a series looking at the lawsuit against the Trump Foundation, brought by the New York State Attorney General. See all the posts here. The New York state lawsuit against the Trump Foundation first discusses some general deficiencies with the operations of the Foundation as well as the legal authority for this action by the New York Attorney General. I examined these in the first three blogs in this series. Next, the legal document delves into specific activities that it characterizes as either political activity or related-party transactions, both of which are inappropriate for private foundations. In this blog I will review some of the charges around the foundation's political activities. The AG makes the general statement that in 2016 the Trump Foundation board “knowingly permitted the foundation to be coopted by Mr. Trump’s presidential campaign.” This is a significant charge as such activity would clearly violate the long-standing prohibitions against political activity and perhaps also the prohibitions against related-party transactions given that Trump the candidate, foundation board member and individual are all the same person. The AG’s investigation found that the fundraiser was “planned, organized, financed and directed by the Campaign with administrative assistance from the Foundation.” The lawsuit cites a number of facts that it casts in a suspicious light: the fundraiser was billed as the “Donald J. Trump Special Event for Veterans”; an Iowa campaign staffer was the event organizer; a campaign staff member distributed the funds raised to various veterans groups; a campaign consultant created the donation website; a Trump Organization controller assisted in the website development; there was the distribution of checks to vets groups at campaign rallies; enlarged check copies used for presentation purposes contained the "Make America Great Again" logo; and while the website was called DonaldTrumpForVets.com, the website also noted that the Donald J. Trump Foundation was a 501(c)(3) nonprofit organization. It was clear that donors were donating to the Trump Foundation and not a special entity specifically related to the fundraiser. This was the way it had to be since the DonaldTrumpForVets name was not a legal entity and not a 501(c)(3) charity. This is not unusual in the world of philanthropy and special-purpose fundraising. As noted in an earlier blog, most private foundations have no paid staff and the foundation usually relies on the founder’s business or other contacts to perform tasks needed to generate revenue. And, while many private foundations only receive funds from the foundation founder, many solicit donations from the general public as well. Although this is a common practice, if you have a private foundation and your business handles some or all of the foundation’s organizational work you need to realize how such arrangements were viewed by the New York AG. Donated services from other entities is viewed in this case as a damaging association. The lawsuit discusses the Iowa fundraiser in detail. The fact that the fundraiser was televised was noted. 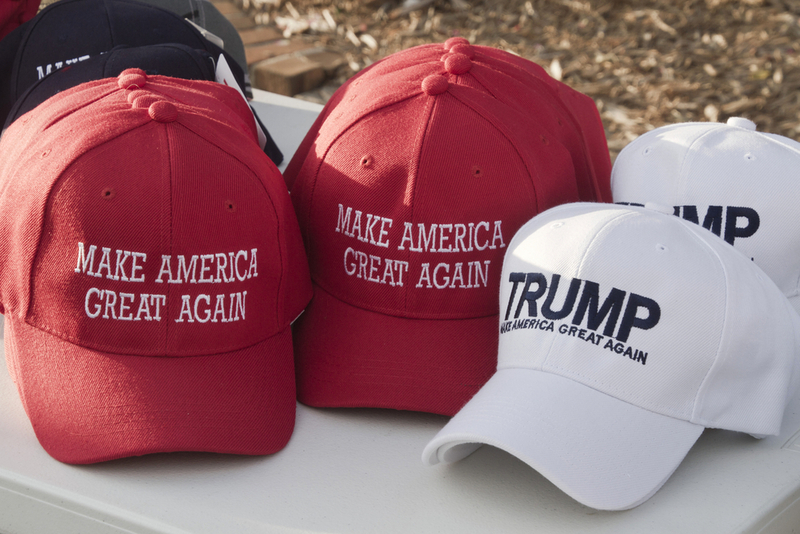 It was also noted that the color scheme and signage was “identical to the design of Campaign signs and billboards.” Lastly, it was noted that the campaign’s trademarked slogan, "Make America Great Again" was clearly visible at the Fundraiser. None of these facts is in dispute. However, there are significant implications for other charitable activities if this lawsuit prevails based on these facts, especially for corporate philanthropy. Can the IBM Foundation use the IBM logo? Many people and corporations in America use charitable activities to both to give back to their community and to burnish their image. Numerous highly paid professional athletes also have private foundations, which solicit donations from the general public and then use those donated funds to make charitable contributions in their own name—or the name of the foundation that bears their name. Did Jerry Lewis personally benefit from his annual televised telethons? Did Fischer Electronics benefit from the Avery Fischer Hall in New York City? Does Microsoft benefit from the Gates Foundation activities? Separating charitable intent from the other intangible benefits of philanthropy is going to be a difficult hill for the New York AG to climb. But the fact that she is at the bottom of that hill revving her engines should cause other private foundations pause. Doing good and being highly regarded for doing good are often inseparable. These issues are particularly complicated in certain niches of the nonprofit sector. For example, program underwriting is a well-known fundraising strategy of every public television station in the country. Anyone who watches public television sees program underwriter identification announcements before, after and during the programming. Public Broadcasting’s policy is that all underwriters must be identified by their name and/or logo. Now consider how this relates back to the New York AG’s charges. If the underwriting acknowledgements broadcast by public television are not unrelated advertising income subject to taxation and potentially a cause for loss of the PBS tax-exempt status, then what went on at the Iowa fundraiser also might appear benign. As every presidential candidate has said, a White House run is a 24/7 commitment. Everything Trump did for many, many months was likely done in light of his political aspirations. It may be impossible to separate Trump the candidate from Trump the philanthropist. The timing and announcement of grants from funds raised at the Iowa fundraiser are all noted as evidence that another motive, in addition to the charitable motive, existed. But this is often the case in philanthropy. For example, a building on a college campus that is named for a donor can easily be seen as evidence of the existence of more than a charitable motive. There is no doubt in my mind that Trump benefited from his foundation as he sought to sell himself to American voters. The question for the court hearing the AG's lawsuit will be whether this is a serious legal violation by a private foundation or just an unavoidable consequence of a public figure's philanthropy becoming entwined with his other activities, which is in this case were political. Every every major donor should be interested in the court’s decision.